The SG7-Xstream Snowmaker™ is designed to be fully adjustable for your water supply and snowmaking pump/pressure washer. This snow maker can handle anything from a small 1.3gpm pressure washer all the way to our monster 7.5gpm snowmaking pumps/pressure washers. Just remember, the more water (gpm) flowing through your pump, the more snow you are making! High Pressure Liquid PSI Gauge included to synchronize your snowmaker and pressure washer capabilities. The head is fabricated from solid anodized aluminum yielding a commercial quality snowmaker available for the home or small business owner. Through precision machining, our exacting standards for proper nozzle alignment and quality construction are achieved. The internal structure provides for a very durable product. The inner air and water chambers are pressure rated for 5000psi! The solid aluminum head acts as a heat sink to warm the air chamber and cool the water temperature resulting in an increased snow production volume. Cooling fins create an increased surface area and aid in thermo regulation. The New design helps prevent air nozzle freezing issues that can occur with designs utilizing multiple internal components. 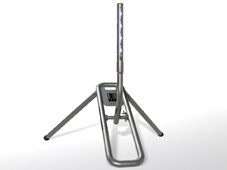 Integrated LED plume illumination allows for easy visual system check and exciting lighted snowmaking display. It has taken years of research utilizing everything from flow meters to microbolometers to be able to design the ULTIMATE home snow making nozzle. Based on our findings we have precision nozzles that are now manufactured specifically for SAH™. The SG7-Xstream snowmaker incorporates four of these upper misting nozzles. The latest in SAH’s™ line of nozzles is our precision designed, stainless steel air nozzle. Working in combination with the nucleation nozzle, an incredibly complex nozzle, the exact self-regulating requirements for the perfect seeding conditions are created. Two, ten foot, 3000psi, high pressure hoses, for air and water. The air hose comes with a removable, ¼” NPT, quick connect air adapter making it compatible with SAH’s™ 5.4cfm air compressor and most other compressors on the market. The water hose comes with a 22mm pressure washer adapter making it compatible with SAH’s™ full line of snowmaking pumps/pressure washers and most small pressure washers (2.1gpm and under) designed for home use. The stand has been designed for safety, stability, and to handle the demands of our snowmakers. 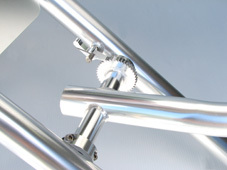 Quick release legs for easy compact storage, with an opening at the insertion point that allows for additional sand weighting of the frame. Temperature 29° Fahrenheit / -2°Celsius or less. See Snowmaking Chart. Air Compressor - electric or gas: rated for continuous use (not oil free) with a minimum output of 5.4CFM at 90PSI. (Minimum maintained operation pressure of 50psi) SNOWatHOME™ recommends the SAH-5490AC 5.4 CFM Air Compressor. Pressure Washer - any electric or gas: rated from 1.3GPM to 8GPM (more water gpm equals more snow) with a pressure range of 1200psi to 4000psi. 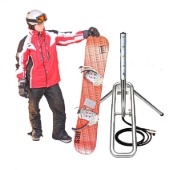 SNOWatHOME™ recommends SAH’s™ 6-7.5GPM Snowmaking Pumps/Pressure Washers. click above image to enlarge, click and drag right or left to rotate, click and drag down to view from top.